The M4 Tech replaces the M4 series. It is designed to use very committed Cross Country, Enduro and Freeride light. 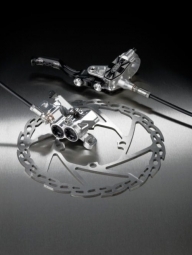 This brake is a perfect blend of power, progressive and reliability. - CNC machined in Barnoldswick, England. - For driving the second pads. - 9.74 Post mount bracket, supplied without adapter. - Ability to change the pads on top of the caliper. Supplied without hard or adapter.